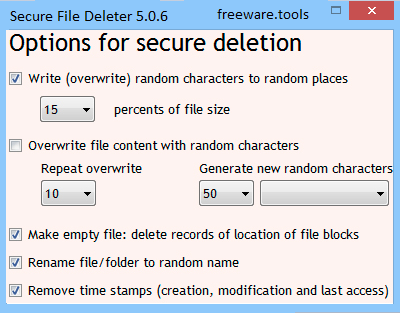 Secure File Deleter This free tool will permanently wipe the contents of deleted files so that nobody would be able to recover them even using special tools. The contents of deleted files will be overwritten using random data; you can choose many security algorithms for data destruction. The program can write a combination of ones and zeroes or any characters onto any sector of your hard drive. We designed a simple user-friendly interface, but the program is very professional and powerful; it's full of valuable security features. With this tool, there is no need to overwrite the entire free disk space, which usually takes many hours; everything will be done very quickly. Working with sensitive information usually results in residue files that, if not properly disposed of, might jeopardize your computer's and your personal security, as well. However, nowadays there is a broad variety of software solutions that can help you securely remove files from your computer, thus preventing other from accessing them. One of these applications is Secure File Deleter. Please note that .NET Framework is required so this application can function as intended. Secure File Deleter is a lightweight application that can help you protect the security of your computer by allowing you to permanently remove any documents you no longer find necessary. It comes with a minimalistic user interface that integrates straightforward controls, thus making it highly accessible to a wide range of users. However, since this application's purpose is to remove files and prevent other programs from recovering the deleted content, caution is advised, especially for computer novices. Additionally, you can access an advanced settings menu that allows you to configure certain parameters, such as choosing your preferred algorithm, specifying the number of overwrites or emptying the file content. After you decide which option combination better suits your preferences, you just need to press the Save button and proceed with deleting the files from your computer. More so, this application allows you to either remove each file individually or load an entire folder's worth of files, thus providing you with more control over the process. When loading an entire folder, the program automatically includes any existing sub-folders. To wrap it up, Secure File Deleter is a simple, yet powerful utility that allows you to safely and permanently remove files from your computer in an easy, efficient manner. It comes with a simple user interface that incorporates straightforward functions, thus proving itself to be a valuable asset.